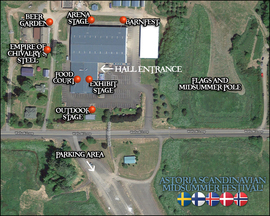 The Astoria Scandinavian Midsummer Festival has been a tradition on the North Coast of Oregon for over fifty years. The Festival takes place typically on the 3rd full weekend of June. The festival embodies the rich cultural heritage that was transplanted to the Astoria, Oregon region by emigrating Scandinavians. In the Pacific Northwest they found the same bounteous seas and forests as in their native lands and the demand for their skills at managing them. During the three days of the festival over a dozen Scandinavian musical, dance, and theater groups are scheduled to entertain. Retail booths will offer handcrafts, Scandinavian import items, and traditional Scandinavian foods. ©2018 Astoria Scandinavian Festival Association. All rights reserved. Website by Redhare.